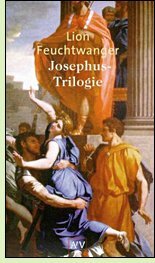 In his trio of novels Josephus, The Jew of Rome, and Josephus and the Emperor, Lion Feuchtwanger produces literature of astonishing power from a decidedly unpromising subject. I don’t know of any ancient author - and few of any era - easier to dislike than Flavius Josephus, the author of The Jewish War, an indispensable source on the final two centuries of the kingdom of Judea. Josephus, one of the Jewish leaders instrumental in bringing about the fatal revolt against Roman rule which led to the destruction of the Second Temple of Jerusalem, managed to switch sides in the middle of the conflict and avoid the martyrdom that claimed so many thousands of his fellow Jews. So although he was both a participant in and our best source for one of the most important turning points in the history of the Jewish people, it’s still a hard sell to explain why it would be rewarding to read a three-volume series of historical novels about him. On his own testimony, Josephus seems repellent, a sycophant who celebrated his status as turncoat and gushed over the slaughter of his compatriots because their deaths reflect the triumph of his new patron, the commander of the Roman forces. But Feuchtwanger’s inside view of a flawed man making bad decisions evokes far more sympathy than the self-serving writer Josephus ever did when he tried to justify his actions in print. The trilogy deals with the huge issues at stake when rebellion against Rome destroys the central symbol of the Jewish religion, forcing key historical changes in that faith. It probes the problems of religious tolerance and cultural assimilation, draws genuine tragedy from Josephus' disastrous career, and in parallel to his story, offers incisive portraits of the three Flavian emperors, Vespasian, Titus, and Domitian. The novels provide masterful insights into momentous events.